European Union political leaders have announced that their response to the staggering loss of life amongst migrants crossing the Mediterranean in unseaworthy vessels will be military action. They aim to employ deadly force in order smash the so-called ‘networks’ that operate out of Libya to orchestrate the perilous sea crossings. There will be ‘collateral damage’, they acknowledge, adults and children boarding or aboard the vessels under attack will be killed. But this does not deter them. Why not? Where is the moral justification for some of the world’s richest nations employing their military might in a manner that will kill men, women and children from some of the world’s poorest and most war torn regions? A dangerous perversion of history is being peddled to answer this question. In recent years, policy on unauthorized movement across borders has drawn a distinction between the activities of ‘people smugglers’ and those of ‘human traffickers’. Smuggling, it is said, involves voluntary, consensual arrangements, but trafficking, entails coercion or deception, and has been repeatedly likened to the transatlantic slave trade by politicians, journalists, and even some contemporary anti-slavery campaigners. The dangers of the analogy are now made manifest, with the terms ‘smuggling’ and ‘trafficking’ being employed interchangeably in relation to migrants crossing the Mediterranean. 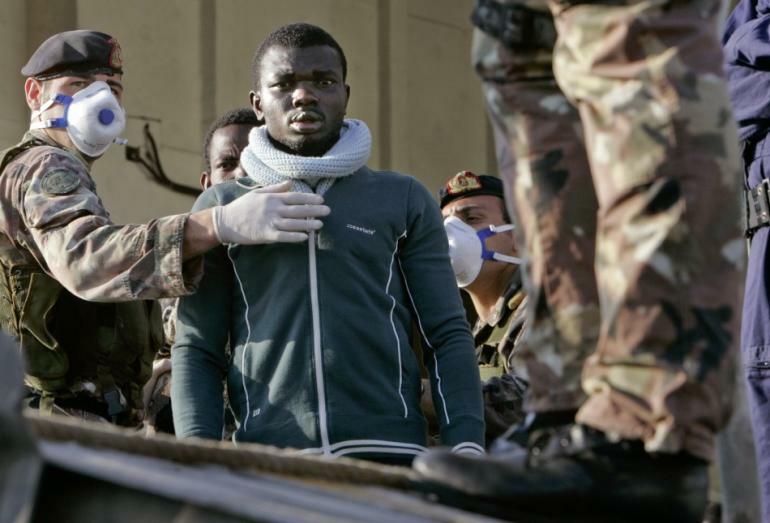 This elision allows EU leaders to justify their decision to employ military force on the North African coast as a ‘tough choice’ forced upon them by the sudden appearance of a far greater evil – a modern slave trade. The EU leaders present themselves as modern-day William Wilberforces, embarking on a high-minded crusade. But this is patently false and entirely self-serving. As scholarship on the history of slavery makes painfully clear, what is happening in the Mediterranean today does not even remotely resemble the transatlantic slave trade. Enslaved Africans did not want to move. They were held in dungeons before being shackled and loaded onto ships. They had to be prevented from choosing suicide over forcible transportation. That transportation led to a single and utterly appalling outcome – slavery. Today, those embarking on the journey to Europe want to move. If they were free to do so, they would be taking advantage of the safe flights that budget airlines operate between North Africa and Europe at a tiny fraction of the cost of the extraordinarily dangerous sea passage. It’s true that would-be migrants are sometimes held in terrifying conditions in Libya, but not in dungeons as a precursor to being forcibly shipped as slaves. Rather, many are held in immigration detention centres, partly funded by the EU, where both adults and children are at risk of violence, including whippings, beatings and torture [ http://www.hrw.org/news/2014/06/22/libya-whipped-beaten-and-hung-trees ]. And the outcome for those who make it onto boats is uncertain. Some die en-route, some survive only to be exploited and abused at the point of destination. But others who survive secure at least a chance of accessing rights, protection, family reunion, education, work, freedom from persecution, and so on. This is not the contemporary equivalent of the transatlantic slave trade. To attempt to crush it with military force is not to take a noble stand against the evil of slavery, or even against ‘trafficking’. It is simply to continue a long tradition in which states, including slave states of the eighteenth and nineteenth century, use violence to prevent certain groups of human beings from moving freely. There is no moral basis for the use of lethal force against peaceable women, men and children, including victims of torture, and those fleeing persecution and war. Europe’s leaders and people must remember their own history, recent and not so recent, and the responsibilities Europe bears for the bodies in the Mediterranean and the people on the boats. We call for the resettlement of many more refugees within Europe and the dismantling of the barriers to movement that have been put in the way of all but the most wealthy. We demand that Europe’s political leaders stop abusing the history of transatlantic slavery to legitimize military and migrant deterrent actions, and instead recall, and act upon the demands for freedom of movement, or ‘a right of locomotion’ articulated by African American anti-slavery activists of the nineteenth century.